Right Products. Right Place. Right Time. Every Time. If your business does its own fulfillment, you'll benefit greatly from our shipping software, TrueCommerce Pack & Ship. This application is a cloud-based, multi-carrier shipping software and packing solution built on the TrueCommerce Foundry technology platform. Pack & Ship enables your company to fulfill orders with one hundred percent accuracy which reduces returns. 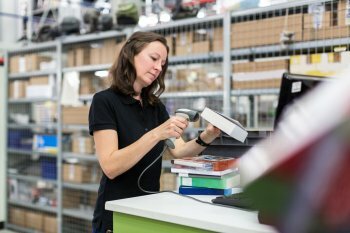 Every item is verified before being put into a box or on a pallet so you have a digital record of who packed a package along with all of its contents. Our shipping software also selects the most cost-effective shipping method to get your package from point A to point B, resulting in significant monetary savings for your company. 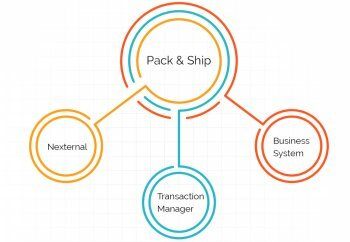 Pack & Ship is easy to use with an intuitive interface and is designed to not only streamline your fulfillment operation, but also bring packers up to speed quickly which is very important for seasonal businesses. It also works great for organizations fulfilling orders as dropship vendors and those selling to the traditional retail community. TrueCommerce Pack & Ship supports a guided packing process with support for both mixed carton packing and full case packing. Products can be verified via multiple methods before being placed in a carton. The most accurate is barcode scanning, however, the product display is configurable and allows for product images to be rendered in the interface should you have products sans barcodes that would benefit from visual verification. Furthermore, line items quantities are checked and decremented so that the right number of products ship in each package. Pack & Ship also can create ASNs (Advanced Shipping Notices) so you can let your EDI trading partners know when their orders are on the way. Pack & Ship also validates addresses down to the rooftop level to make sure you are not sending packages to invalid locations. 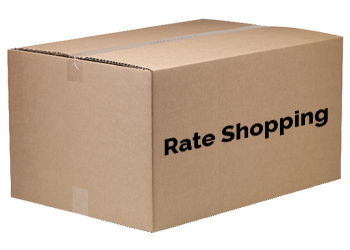 A huge benefit of TrueCommerce Pack & Ship is rate shopping. For example, if a consumer has selected two day shipping, Pack & Ship can select the carrier with the most affordable rate based on the ship from location, ship to location, and estimated time in transit. Over the course of hundreds of orders, your business will save thousands of dollars. What's also amazing is that Pack & Ship can create labels for more than sixty different shipping carriers! This includes the popular ones such as UPS, FedEx, and USPS, and smaller ones such as OnTrac, GSO, and Deliv. It also works with carriers outside of the United States including Canada Post and DHL. Furthermore, our shipping software will print both paper and electronic commercial invoices for international shipments. As would expect, Pack & Ship also supports both LTL (less than truckload) and FTL (full truckload). In addition to generating shipping labels, Pack & Ship will print packing lists and commercial invoices. Best of all, these documents can be customized to include your branding. If you are drop-shipping on behalf of other retailers, you can also brand the packing slips accordingly. It is also able to print GS1 ASN labels and placards. When orders are complete, you have the option of having Pack & Ship send a ship notification email to the end user with tracking information or in some cases an ASN to the ultimate receiver. Using our reporting tool, you can also look at analytics of tracking carrier spend and shipment trends. Finally, Pack & Ship is also able to create return shipping labels which can be included in all out-going packages or just a subset. In addition to having a pre-built integration with Nexternal, Pack & Ship offers prebuilt integrations with QuickBooks and TrueCommerce Transaction Manager. Changing an order status in one of those systems can trigger the order to flow into Pack & Ship for fulfillment. Once the order has shipped, order status and tracking information automatically flows through our integration gateway and back to the master system of record.